The American pattern from the Fostoria Glass Co. is the most collected pattern of Fostoria's glassware. It is also known as No. 2056. The pieces were introduced in 1915 and continued in production until 1986. Throughout its 70-year production, the American line inspired many look-alikes. During the last two years of production, the American pattern was made by the Indiana Glass Co. After 1986, the molds were sold to Dalzell-Viking Glass Co., which made select pieces of this pattern through the late 1990s. Knowing the difference between the old Fostoria pieces, newer Fostoria and look-alikes can be challenging even for experienced collectors. Determine the type of Fostoria piece you are looking at. Some of the earliest glassware in the American line were the "Boudoir" pieces. A prized and rare old American pattern of the Boudoir set is the Boudoir jar, often confused with the regular quart jar. Other earlier and more limited pieces include the hurricane lamp, mustard jar or inkwell, hairpin box, and molasses can. Weigh and measure the glassware. Older Fostoria American glassware is heavy. Newer pieces, sometimes made with the same molds, are lighter. A reference book will give the exact measurements. Measurements off by 1/2 inch indicate a new piece. Look at the glassware under good lighting. 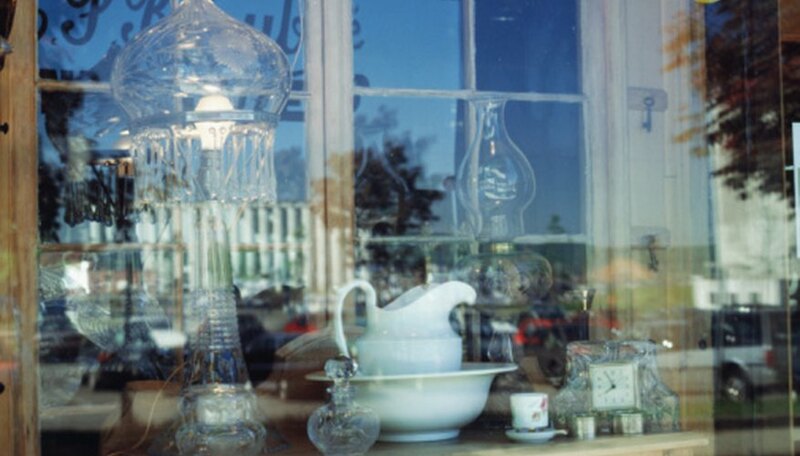 Authentic Fostoria American pieces are clear, crisp and easy to see through. Newer pieces often appear dull. Fostoria used a fire-polishing technique. Feel the edges of the glassware. The Fostoria American pieces have sharply defined edging. New pieces have a more rounded appearance and feel. The distinct raised-cube design stands out against a flatter look-alike. Know the years that Fostoria made the American pattern in color. Most of the American pattern is crystal with no color. From 1925 to 1927, some pieces were introduced in azure blue, canary and light green. In the mid-1950s through 1963, the American line was available in white and light green milk glass. Toward the end of production of the official American line, a cobalt blue was used. Other colors indicate the piece is part of Depression glass, made by Jeanette Glass, or from the Indiana Glass Co.
Visit an antique dealer to get hands-on experience comparing the weights and quality of the pieces. The American pattern is readily available, and the shop may have some look-alike pieces, which are collectible in their own right. The earliest look-alikes were the Cubist pattern made by Jeanette in the 1930s. Collecting newer pieces of the American pattern to match a set is fine, especially as a placeholder until you find the older, genuine Fostoria. To determine the authenticity of crystal Fostoria, place the piece under a black light. If it is authentic Fostoria, it will glow yellow. Be careful buying Fostoria glassware online. Without personal examination, it is difficult to know if it is a newer reproduction. Ask the seller the weight and clarity of the piece and know the return policy. Chris Mayercin has over five years of experience in unemployment claims management and assists employers in controlling their unemployment costs. Mayercin drafts effective and succinct protests on a daily basis against unwarranted unemployment claims for companies ranging from the small family business to national corporations. Her expertise has been shared with prospective clients in Ohio via informational and educational presentations at seminars throughout the state.